BERLIN–I’ve been to CES 15 times and I’ve only attended IFA once, so I don’t have an enormous amount of experience with this trade show to compare it to the one that’s been welded to my calendar since 1998. But a few things jump out at me. Another reason has to be the location. The Las Vegas Convention Center consists of three enormous halls large enough to store airplane hangars, while the Berlin Messe sprawls across 27 smaller structures. The LVCC pays for that simpler setup with perpetually gridlocked connecting passages, while this facility offers more, and more confusing, ways to get around. Some of these connections can only be described as Escher-esque. The Berlin Messe also offers more food options with shorter lines–and beer on tap–and its bathrooms seem less disgusting than the LVCC’s. The selection of exhibitors at IFA and CES doesn’t overlap nearly as much as I thought. While you have the same usual electronics-industry suspects–LG, Panasonic, Samsung, Sony, Toshiba but, of course, not Apple–IFA draws fewer obscure Asian manufacturers but collects far more appliance vendors. These companies, many European-only operations that I’d never heard of until getting here, fill the lower levels of eight halls. I have never felt so inadequate about my oven, dishwasher, refrigerator, washer and dryer until now. Another, more pleasant, side effect: All of these manufacturers feel compelled to show off how well these machines work by offering snacks and beverages prepared with them, causing this part of IFA to double as a cooking show. Getting to and from the show and around the city, however, is no contest: The U-Bahn shuts down the Las Vegas Monorail in every way. Berlin itself is more my kind of city, with things like walkable neighborhoods, mostly human-scale architecture and trees that can grow without constant irrigation. Yeah, Vegas has casinos–but there is one a short walk from the press center here, on the third floor of Hall 7. I think I’ll show a little more common sense than I do at most CESes and save that distraction for some other time. 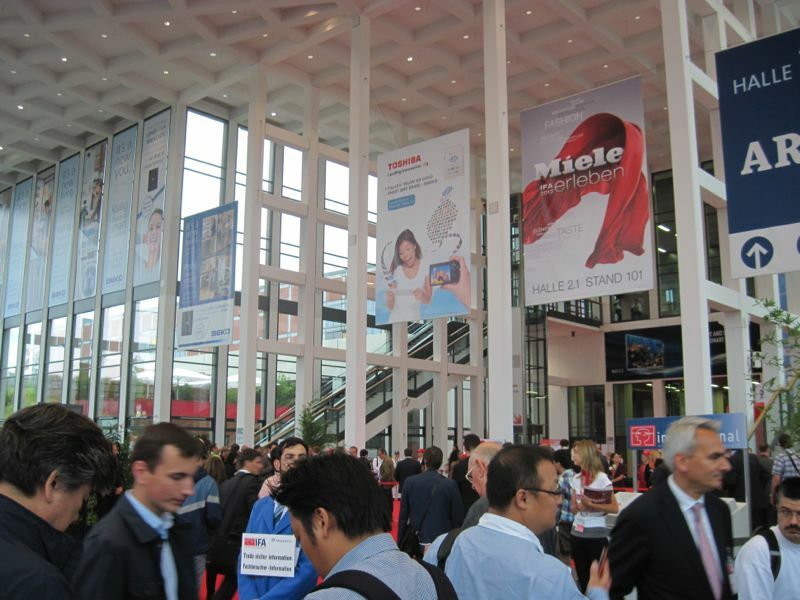 This entry was posted in Journalism, PR, Work and tagged Berlin, Berlin Messe, ces, conventions, IFA, Las Vegas, Las Vegas Monorail, lvcc, Nevada, trade shows, U-Bahn, Vegas by robpegoraro. Bookmark the permalink. Is there a blog website that tends to make it easy to perform voyage calculations? I never like to use Android, does that matter?